Pont-rhyd-y-fen is the name of a village in the Afan Valley close to the confluence of the river Pelenna with the larger river Afan. Pont-rhyd-y-fen contains three main elements, Welsh pont ‘bridge’, rhyd ‘ford’ and ben ‘cart, waggon’ giving ‘bridge and ford of the waggon’. One would guess that the early name would have been Rhyd-y-fen, as the ford would have predated the bridge and the 1460-80 form of Ryd y venn ‘the cart ford’ confirms this. By 1536-39 a bridge had been erected nearby as signified by ponte Rethven of that date and a later Pont Rhyd y ven of 1714. A farm holding land by the bridge and ford is recorded in 1601 as Tir pont rydyven and as Tyr Pen Pont Rhyd y ven ‘land at the end of the cart ford and bridge’ in 1756. When the coal-mining village was established during the 19th century it took an abbreviated name of Pont rhyd-yfen, discarding the earlier tir ‘land’ and pen ‘end’ of 1756. The photo opposite shows the two 19th century bridges there. I am grateful to Gwynedd o. Pierce for recording the early dates and forms in his article on Pont-rhyd-y-fen in ‘Ar Draws Gwlad 2’ page 82. Auan, Auen c.1150, Hist. Margam, 24. Aven a. 1167, Hist. Margam, 35. The two rivers of Avana 12th cent. Hist. Margam, 135. The Great Aven 1208 Hist. Margam, 181. Avyn 14th cent. R.B.B. 412. Avan, Aven 1443 Hist. Margam, 344. Avon, Avon Vaur, Avon Vechan 1536-9, Leland, 29, 30. Avan Fechan alias Abergwenffrwd 1601 Bushby Coll. The River Avan, Avan Fechan c.1700, Lhuyd Paroch. III. 6. This river rises on Crug Afan in Blaen Afan and flows by Cymer Afan (where it is joined by the Corrwg stream) and Pont Rhyd-y-fen, through Cwm Afan onwards to Llanfihangel Ynys Afan (Michaelston-super-Avan) and into the sea at Aberafan. The Afan Fechan (the lesser Afan) joins the Afan at Cymer Dwy Afan in Pont Rhyd-y-fen. There is an old chapel dedicated to Illtud at Argoed Afan. One etymology links Afan with the Latin Amandus, but Avan occurs in Breton as a masc. and fem. pers. name, with its Scottish equivalent as saint Aban or Abann; while Abana is a Gallic fem. pers. name. If the Afan pers. name is seen here as the Afan river-name, then it is another example of a pers. name standing alone as a river-name as in Bradach, Adda, Alun, Beuno, Cynfael, Cynon, Dewi, etc. having lost the accompanying afon or nant. It is also possible that afan emanates from old Irish abann ‘river'. It would appear then to be either a borrowing from Old Irish, or descended from a form that was at one time, common to all Celtic languages. The Welsh coll. or pl. n. afan ‘raspberries', must also be remembered. The examples recorded at the top of the page show that this river-name (which was also the name of the commote or lordship) had varying early forms of Afan, Afen Afyn although Afan alone survived. These different forms were the effects of a lost ultimate vowel. Or is the reason for the Aven form (that occurs mainly in official documents) the fact that Aven or Afene, a weakening of the earlier Afone form, is the most common form used in Mid. English for the numerous Avon rivers in England? The above is a translated and paraphrased account of R. J. Thomas's article in EANC pp35-36. This is the most comprehensive and detailed discussion that I have read on this river-name. Most present day toponymists tend to favour the Afan pers. name etymology. [ see HWO & RM in DWPN; Howard Jones in Place Names in Glamorgan; MR in The Names of Towns and Cities in Britain.] Port Talbot philologist Alwyn B. Jones however favours Taliesin ab Iolo's a and ban ‘from the heights'. Whatever the etymology, the River Afan contains an old, respected and continuous place-name element. It should not be confused with afon, the Welsh word for ‘river'. Afan has been in use for hundreds of years, since its inception during the early middle ages. Let us respect its history and preserve its longevity. Mr. Evan Evans and his nephew Mr. David Bevan were the eponymous Evans and Bevan of the Vale of Neath Brewery in Cadoxton. They also built an ‘anthracite empire’ in the Dulais Valley. Seven Sisters was the bright idea of David Bevan’s only son Evan Evans Bevan, who suggested at the opening ceremony in 1872, that the Dylais Valley Colliery be named after his ‘seven sisters’. The pit was in production by 1875 and by 1882, the village had adopted the colliery name. 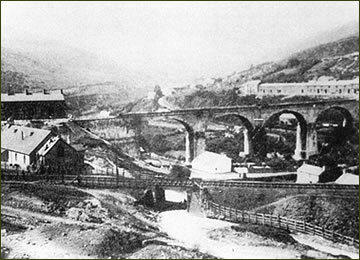 The earlier name for the land around the colliery was Blaendulais, as it was located at the head of the Dulais stream. Today the village is known as both Seven Sisters and Blaendulais. Banwen is the name of a small anthracite mining village located on moorland between Seven sisiters/Blaendulais and Glynneath/Glyn-nedd. The moorland is known as Banwen Pyrddin. Banwen is the mutated dialect form of the Welsh noun panwaun. Panwaun contains two elements – pân and gwaun. In this instance, gwaun is Welsh for wet high level moor land, and is explained by lexicographer William Gambold as ‘A plain on top of a mountain’. Pân is the word in some parts of south Wales for ‘cotton grass’, which is also known as ‘plu’r gweunydd’ (literally, ‘the moorlands' feathers’). Panwaun is the name for an area of mountain fen, largely covered by cotton grass. Gwayne Banwen is tautologous, as gwaun is already present in banwen (panwaun). The banwen place-name element is found elsewhere in south Wales, therefore pyrddin is used as a distinguishing element in Banwen Pyrddin. It is the name of a small stream, (Afon Pyrddin) that flows through the moor land before joining the Nedd Fechan near Pwll du ar Byrddin. The etymology of pyrddin is difficult. On the face of it, one could be drawn towards the Welsh noun purddyn, ‘pure man, good man; puritan’, but this etymology is unsound due to the variances of the earlier 1468 and 12th cent. forms.